This is the rebranded for paperback publishing version of Jeff Allen's original book Nine Ball. Follow this link to see the original. Our Editor review is the same since it is the same book. Before, players share their field reports, strategies, and results. They compare notes, exchange critiques, and figure out a body of knowledge that defied everything men had ever been told about getting women—what has since come to be known as game. 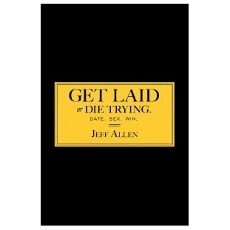 "Get Laid or Die Trying: The Field Reports" presents in utterly shameless, hilarious, and graphic detail, Jeffy’s gritty, 100 percent real, and jaw-droppingly astonishing feats of seduction. I wonder what is the point of just having many short stories about success with women without revealing information on how or making it have a point. I thought it would be another "the game - neil strauss" which i really loved, but this is so awful that i couldnt finish it.